Home » Tulips - a symbol imperial and solidarity. Excursions by the nature of Kazakhstan. Tours behind tulips in the Central Asia. Michael Pollan, The Botany of Desire: A Plant's-Eye View of the World. Excursion to tulipTurkestanica in Kazakhstan. 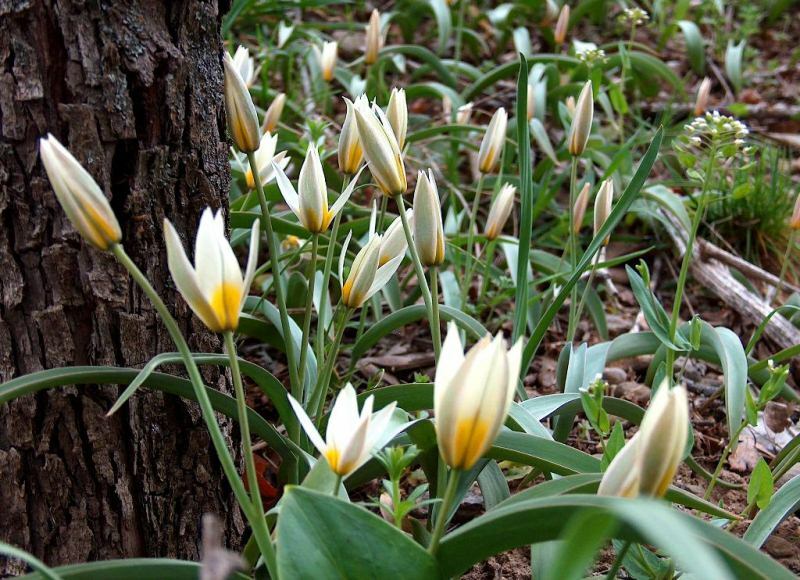 Tulipa turkestanica (Regel) Regel. Stem 10 - 25 cm tall, brownish-green, pubescent, with short hair at the top; bulb is wide-ovoid, 2 cm in diameter, with several prolonged upwards black-brown rigid, coriaceous, woolly scales at the apex inside. Leaves 2 - 3, rarely 4, glaucous-green with tints of claret red, linear or lorate, 5 - 23 mm wide, exceeding the flower. Flowers 1 - 7 in number, white or creamy-greenish with yellow center; filaments yellow, with dense hairy ring at extended base, anthers are yellow rarely violet. Fruit case is straw-white, 3 cm long, 1,8 cm wide, oblong, pointed at the top and at the base. 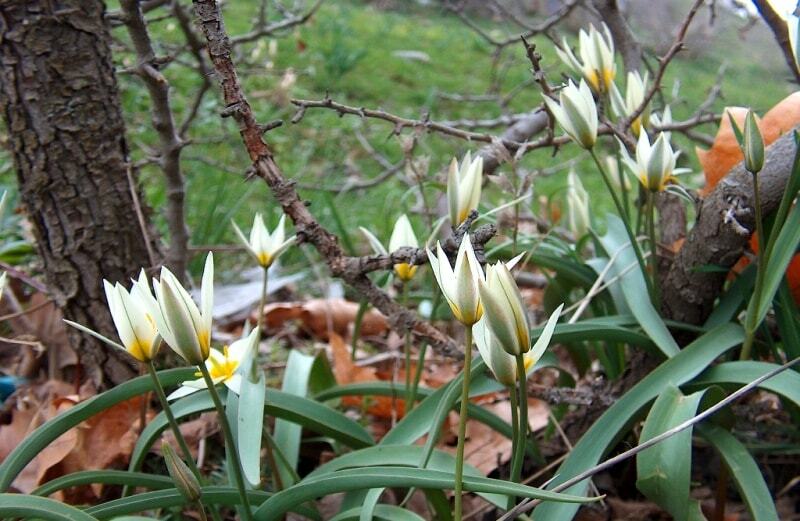 Flowering time in the end of March – June. Distribution in Kazakhstan: Endemic of Western Tien-Shan and Pamir-Alai with disconnected area. Clay and stony slopes from foothills to average mountain belt. Western Tien Shan (South Kazakhstan region). 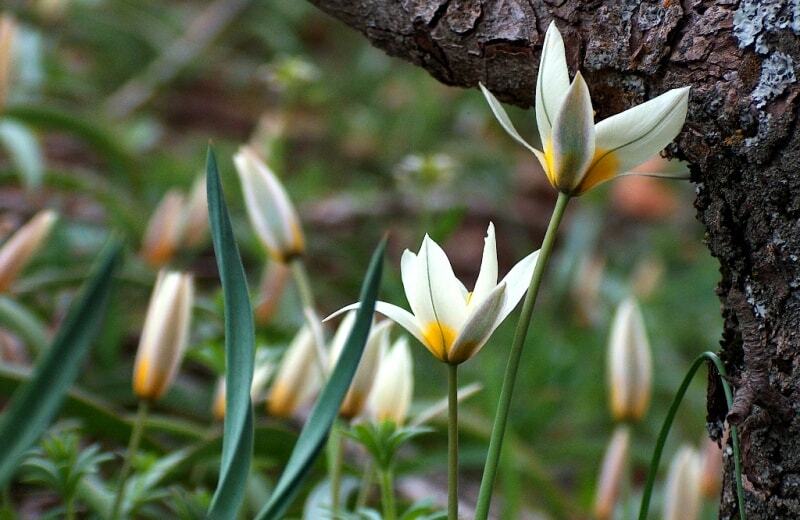 “Tulips of Kazakhstan”. Almaty, LTD “Almatykitap baspasy”. 2010, 272 p. Illustrated.